I read lots of IT management books and try to narrow down the best ones to recommend to Computerworld’s readers. 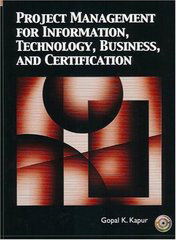 Project Management for Information, Technology, Business and Certification, by Gopal K. Kapur (Prentice Hall; 528 pages). This is one of the most comprehensive books on project management. Not that this should come as a surprise, given Kapur’s pedigree as the founder of the Center for Project Management and his decades of hands-on experience in working with everyone in the enterprise, from the CEO to end users. I found myself dog-earing page after page with insights I wanted to revisit. (“During the last two decades, there have been numerous instances where management decided to train people in the use of project management software, without first training them in project management principles and practices.”) Kapur, who’s a Computerworld columnist, lists some of the primary reasons for project failures, including unclear business objectives, complexity and risks discovered too late in the project life cycle. He then offers advice on how to achieve success. Readers will likely be intrigued by “the mocking post” concept found on page 49 of the book.